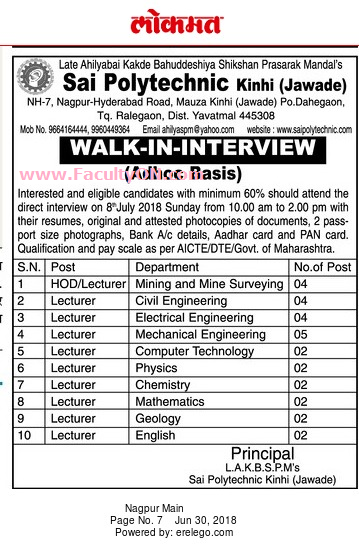 Sai Polytechnic, Yavatmal has advertised in the LOKMAT newspaper for recruitment of Teaching Faculty- Lecturers / HOD jobs vacancies. Interested and eligible job aspirants are requested to walk-in on 08th July 2018. Check out further more details below. About College: Sai Polytechnic at Kinhi (Jawade) was established in the year 2009 with the objective to uplift the tribal, ruler and urban student in education particularly in the fields of Engg. Technology. Realization of importance of technical education Sal Polytechnic started in Yavatmal district 'Sai Polytechnic1 in located at Kinhi (Jawade) Ta. Ralegaon. How to Apply: Interested candidates are required to attend the Walk-in interveiw along with attested copies of educational qualification, Aadhaar card, PAN card, experience certificates, etc, documents, bank account details and 02 recent PP size photos to the walk-in address given below.